Age is a state of mind, not a number. And with Kenzai Silver we'll get both your mind and body to a fitter and healthier place in just 8 weeks! 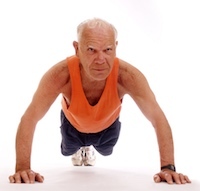 By far our most requested program has been a version of Kenzai training designed for older clients. The challenges of training when you're 60 are quite different than when you were in your 30s or 40s. Kenzai Silver is designed from the ground up to meet these needs and deliver significant improvements in quality of life for trainees 60 and up! Like all Kenzai programs, we'll start with your diet. You'll learn what nutrients your body needs as it ages and which foods are doing you no good. We'll expect you to keep a clean, tight diet, with some room for treats here and there. Don't think this means you won't be exercising. We'll expect you to work hard every day. And yes, you might just get shapelier legs or a six-pack before its all through! Older clients have a completely different set of skills to learn. Each day of your program you'll get an in-depth lesson about how to meet the needs of your changing body and make the most of every day. These lessons will be your field guide to navigating the ups and downs of growing older. When you join Kenzai Silver you'll be placed in a training group with one of our skilled Kenzai trainers and a cohort of fellow Silver trainees. You'll work together to conquer the challenges of a real training cycle, using the power of real human connection to stay motivated and on track. Kenzai Silver trainers will be there for you every step of the way with specialized knowledge about how to make the diet and exercise work for you. Add it all together and in just 8 weeks you'll see how much strength and vitality you've still got in you. The fountain of youth is real, and it looks like this; a clean diet, daily exercise, a plan, and the will to change. We'll provide the first three, you bring the last, and let's show the world how you're not just getting older, you're getting bolder, stronger, and more confident with each passing year! Next program starts on May 6th!